http://slnewserplaces.blogspot.com/2013/01/reader-submitted-tombstone-roleplay-in.html. Breezes Babii also did many articles about things she experienced in the towns and she is still happily living there. 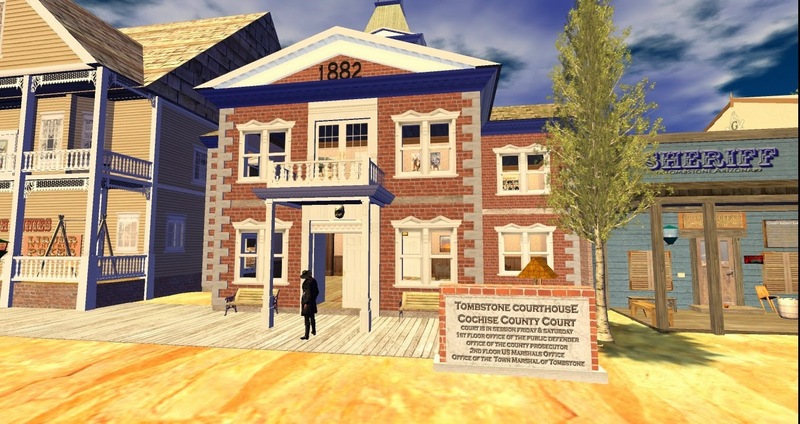 I went over for the trial of one of my fishing friends who lives in Tombstone. The Courthouse was packed when I arrived (late from being lost in the wrong town on the way. ) to witness the hanging trial of Angi Spires. Before the trial started it was necessary to remind all to remove their weapons since one idiot had not parked it at the door. The jury was seated already when I arrived. Angi was seated at the table looking terrible. Her eye was healing from being blackened, rope burns around her neck, and her face was scratched. She was eating a taco handed to her by a compassionate member of the audience. Her eyes looked confused. 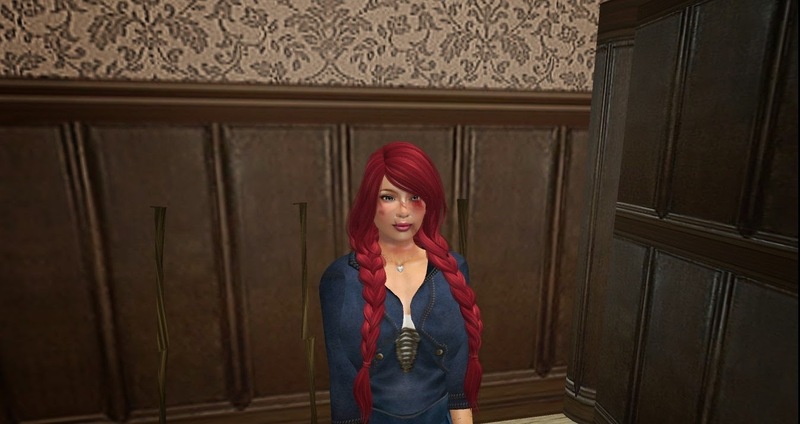 Angi is on trial for shooting Garth 'Dead Eye' Mcleary (gamloth), a self proclaimed territory bad guy. and this may lead to a hanging. There is more to the story it seems and I am hoping it will come out in the testimony. You must realize that in the late 1800‘s the court became more like a theater with many allowances , eating , drinking , smoking allowed by the members of the audience. 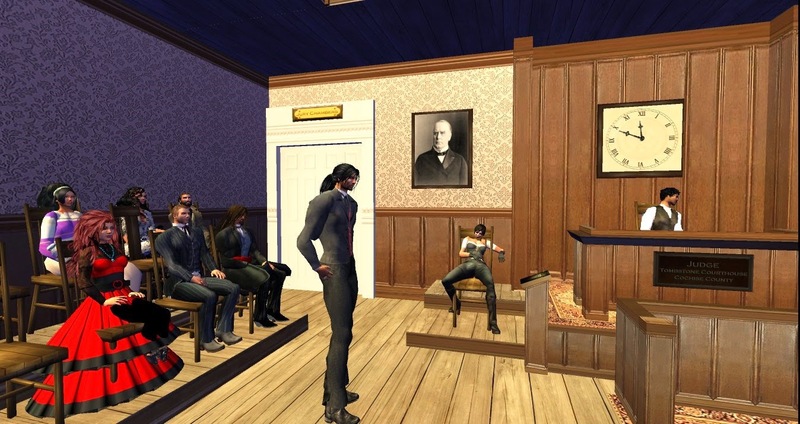 So in this wonderful roleplay sim many of them also made comments to each other and expressed their thoughts in role play mode. This added to the theater of the moment. The decorum of the trial however was well controlled despite the asides and the lawyers well prepared, both prosecution and defense. Jimmi Ruble, the Judge, instructed the jury on conduct , gave us a little history of the court conduct of that era and the trial began. There was not much of an opening statement and the first witness was called The Marshall, Kristoff Jamison , was sworn in, sat and the prosecutor, Nimbrel Sassoon began to question him. Marshall Kris witnessed the whole event. It seems that he was in the process of arresting the man who had wronged her when Angi took out a carrot and tried to shoot him. Well, since that did not work she grabbed a gun from a bystander and finished the job. The Doctor, Jessicajewells. took the stand next to recount her treatment of Angi’s injuries when she was returned after being kidnapped and beaten leading to a complete mental breakdown. Next Paisley Nelson was sworn in and confirmed that her behaviour before the shooting was disoriented. After she left the stand a young girl , Nora ... was called by the defending lawyer, and testified to Angi’s behaviour since she returned from her kidnapping had been completely opposite to her organized previous self. Angi is the Matron of the orphanage and Nora is a helper there. Many of her charges were in the seats witnessing the trial looking sorrowful and frightened when they were not throwing candy at each other. Angi was called to the stand finally and after telling of her tribulation at the hands of Garth and her action in the street, in her confused way threw herself on the mercy of the court by accepting her actions as completely wrong. The trial progressed to its closing statements. The Judge instructed the jury and they retired to the jury room to reach a verdict . There was much discussion in the room with sudden shouts and hollering amidst many comments from the people waiting in the courtroom while they were out. Finally they emerged to the waiting crowd with a verdict of not guilty! The court erupted in applause and relief. Angi was free! The doctor was ordered to treat her and help her recover from all the events . Happy to be released from this long trial( when I arrived the judge said most trials last about an hour but it was now over 2 hours. I was about to leave when shots were heard from outside the court. A man marched in and began to berate the Judge for corruption . Time to leave before getting involved in a new episode. Tomorrow the trial of Angi’s abuser will begin . She left with Nora and the children to go cook chicken.